We all have buckets of sidewalk chalk. How about a fun game putting yours to use. London Calling is a classic pavement game, a cross between hangman and shuffleboard, and inexplicably named London. 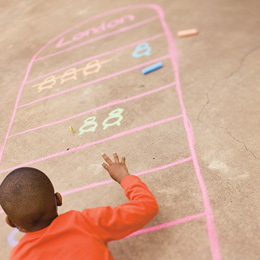 To make the playing field, use chalk to draw a 3- by 5-foot rectangle, then divide it into seven sections as shown. Draw a semicircle on one end and write London inside. On subsequent turns, if a player lands in a space where he has drawn a head, he adds a body to it, then a leg, then another leg. When he completes one chalk person (with a head, a body, and two legs), he begins another person in the space the next time he lands there. If a player lands in London, he gets to add a head to one of the seven spaces or to add a body part to one of the people he has already started. If a player lands in a space where he has three complete people, he draws a line through them to represent linked arms. The winner is the first player to draw three linked people in every space. In one week, millions of families will observe a delightful Memorial Day tradition: They will take their kids to pools and beaches. Most will leave refreshed and ready for more summer fun. None will expect a tragedy. 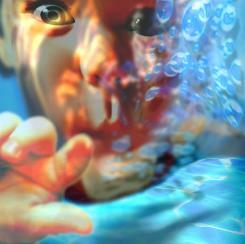 But tragedies and near-misses happen every summer as hundreds of children drown and thousands are injured in the water. “We love these places and they are a lot of fun, but we have to realize there are dangers there,” says Kathleen Reilly, a spokeswoman for the U.S. Consumer Products Safety Commission. The commission is leading a new pool safety campaign, which launches today (see poolsafely.gov). Also today, the American Academy of Pediatrics publishes new safety guidelines in the journal Pediatrics. For the first time, the doctors’ group says that swimming lessons may help prevent drowning in some children ages 1 to 4 but that parents must decide whether kids are physically and emotionally ready to learn. The group has long recommended lessons for children over age 4. And it still says no studies support lessons for babies under age 1. “The official party line has always been that kids under 4 are not ready” and that lessons might give parents a false sense of security, says Jeffrey Weiss, a pediatrician at Phoenix Children’s Hospital and lead author of the new policy. But now that studies suggest early lessons might be helpful, the group has relaxed its stance, he says: “We’re telling parents it’s their call. We’re not saying everyone should run out tomorrow and sign their 2-year-olds up for lessons.” Lessons won’t “drown-proof” any child, he adds. • If you own a pool, enclose it in a four-sided fence at least 4 feet high. • Make sure any pool you use, in public or your own backyard, is equipped with safe drain covers that prevent suction injuries and deaths (these are now required by federal law in public pools). • Learn cardiopulmonary resuscitation (CPR) and water-rescue skills. Have a phone handy. • Supervise children constantly and closely. Fortunately, the pool owner had just taken CPR lessons and started working on Kai as someone else called 911. “By the time the ambulance came, he’d coughed up all the water and he’d started breathing,” Lewis says. Kai fully recovered. That means “no eating, no drinking, no conversing with your friends, no working on your BlackBerry,” says Chrissy Cianflone, director of programs for Safe Kids USA, a non-profit advocacy group. The group’s website (safekids.org) includes a “Water Watcher” tag parents can print out to designate who is on duty at any moment. Even children as young as 2 can help out around the house. The secret? “Parents should present chores in a way that makes little ones feel they’re contributing to the family,” says Robert Billingham, Ph.D., a human development specialist at Indiana University in Bloomington. By setting the dinner table, for example, kids see that they are important and needed — both of which help build their self-esteem. “Chores also help children develop a sense of responsibility,” says Dr. Billingham. Another plus: Daily or weekly chores teach children skills they’ll use throughout their lives, such as setting priorities. Finally, the earlier kids learn to incorporate domestic duties into their everyday routine, the more likely they are to continue helping out when they hit their teen years. Two- to 4-year-olds can put away their toys, carry dirty clothes to the laundry basket or hamper, sort clean socks from the laundry, place napkins on the dinner table, and fill the pet dish with food. ive- to 7-year olds can make their bed, keep the bathroom neat, water plants, set the dinner table, put clothes away in drawers, and keep their rooms clean. Eight- and 9-year olds can prepare after-school snacks, help Mom and Dad cook dinner, wash dishes or load the dishwasher, and take out the garbage. Ten-year-olds and up can do all of the above. In addition, they can fold clean laundry, vacuum, give the dog a bath, wash the car, and help with yard work. A weekly chore chart can help children stay motivated and on track. We’ve created three versions — for 2- to 4-year-olds, 5- to 9-year-olds, and 10-year-olds and older. Print out the one you want and post it on the refrigerator or a bulletin board. Cross out chores you don’t need and fill in ones that are unique to your family in the available blank spaces. The charts will help kids remember what chores need to be done during the week. Once your child completes her task for a specific day, place a sticker in the correct box or let her check it off. We’re On The Fence and couldn’t be happier about it. Come vote for us…and find some other great bloggers to. You can vote every day, and we hope that you do! Thanks for thinking of us. Congratulations to Christine S. over at A Mama Stork Knows!!! She is the winner of our first giveaway. Christine, if you could please email me with your mailing address (momsensenj@yahoo.com), we’ll pop that in the mail to you. I hope the reader of the book enjoys it! Congrats again from Momsense in NJ. We’ll have another book giveaway coming soon. Be A Crafty Mama! Make Your Own Korker Bows! 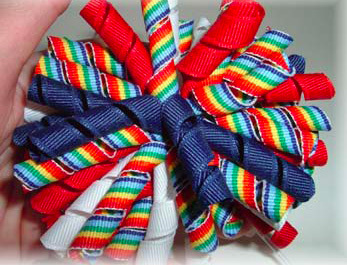 Jilly Beanz Thingz features great instructions on how to make your own korker ribbon bows. Just like the ones selling in Gymboree and Crazy 8. You can make them to match all your daughters clothes. And they make great gifts as well. Click HERE to see the step by step instructions with photos. To read the entire article (we’ll warn you, it’s a bit “scientific”) click HERE. To see the Environmental Working Groups rating of the best suncreens, click HERE. Like us, you may be switching brands after reading. To see the Environmental Working Groups Hall of Shame, click HERE.